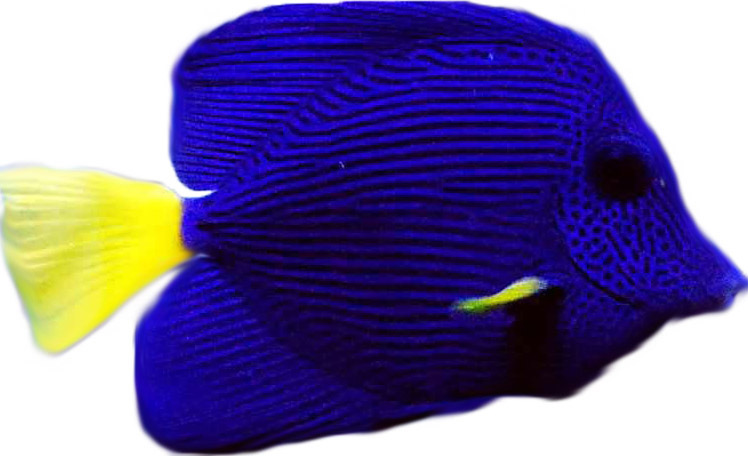 Notes: The Purple Tang is commonly referred as the Yellowtail Sailfin Tang, Yellowtail Surgeonfish, and the Blue Surgeonfish. These are hardy fish that will not bother other tank inhabitants with the sxception of other tangs of the genus Zebrasoma. Although Tangs will eat meaty foods along with the other fish in the aquarium, it is important that they are offered plenty of marine based seaweed and algae. This will strengthen their immune system, reduce aggression and improve their overall health. Offer dried seaweed tied to a rock or use a veggie clip, and feed at least 3 times per week.